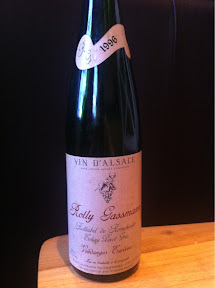 The Rolly Gassmann Tokay Pinot Gris we had last night was wonderful: lush and fruity. Also a chance to reminisce about what we were doing in 1996. Our cat’s had an alien experience…. Our cat’s had an alien experience. He does look quite scary tonight. He has that look. Had a good ski down the Casse de Beouf, 900m black run. Lovely bin chaud in the Bivouac hut, tastes of marmalade.